And all 100% said that they would definitely recommend the Sashmate tools!! I’m a one man workforce. The sashmate has stopped the need for me to use my oldest boy to give me a hand sometimes. So no more calling up the stairs, trying to wake him up. 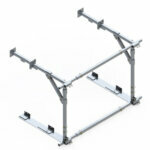 The Sashmate tools are very easy to use and they save me from using ladders. I can now work by myself with my tools by the side of me so I’m not up and down a ladder fetching things. Frictions stays sit in the correct place when putting the window back on. The Sashmate tools save time and money. As I mostly work on my own in double glazing repair it is a great aid having saved many return trips. Having the Sashmate and advising clients of its use etc has given us the edge on some competitors and has gained us work. We did one job for a client replacing over 100 pairs of stays on heavy aluminium sashes and the client was very impressed with the Sashmate & has since given us all of his remedial works. We have done over £20k with this 1 client. We have been able to do jobs above 2nd floor where there has been no external access. Without the Sashmate some jobs would be nearly impossible. Our engineers have also been able to complete jobs on the 1st visit gaining extra works as clients do not get extra time to shop around. I would definitely recommend the Sashmate tools. The Sashmate has allowed us to beat competitors prices by cutting access equipment costs. We take a copy of the demo CD to demonstrate to our clients how we will save them money. On one particular project with difficult access, adjoining rooms and overhanging structures. The use of the Sashmate saved the client over £3000 on hydraulic access equipment. 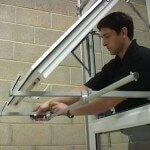 Has made jobs easy and safer, especially on riveted windows because I now have the freedom of using both hands. I bought the tool because I had a job on the third floor and scaffolding would have been too expensive so the Sashmate was a great investment. I am currently working at the Marriott hotel in Kensington, replacing all faulty hinges and sealed units. I cannot change some of the glass units as scaffolding is required but when I explained I will be using the SASHMATE which is recommended by the GGF in the Code Of Practice, they immediately told me to go ahead with replacing all 130 faulty pairs of hinges and app 60 units a contract worth over £22K. The London general manager saw me in action using the SASHMATE, he immediately questioned what I was using and once I answered his questions, he told me to have a look at another large hotel in Maida Vale! Thankyou Daniel, you have a great product and I am very happy using it as I am managing to change approximately 10 pairs of hinges and units per day. Regards Jag. Just thought I would drop you a line, to let you know how pleased we are with both the stronghold and sashmate tools you supplied us last month. We have installed a dozen windows in this time using both systems. Would not hesitate to recommend the systems to anyone else. - Derek Owen. Belvedere Windows. We’ve now been using the Sashmate for a couple of years and this excellent product more than paid for itself on the first job. 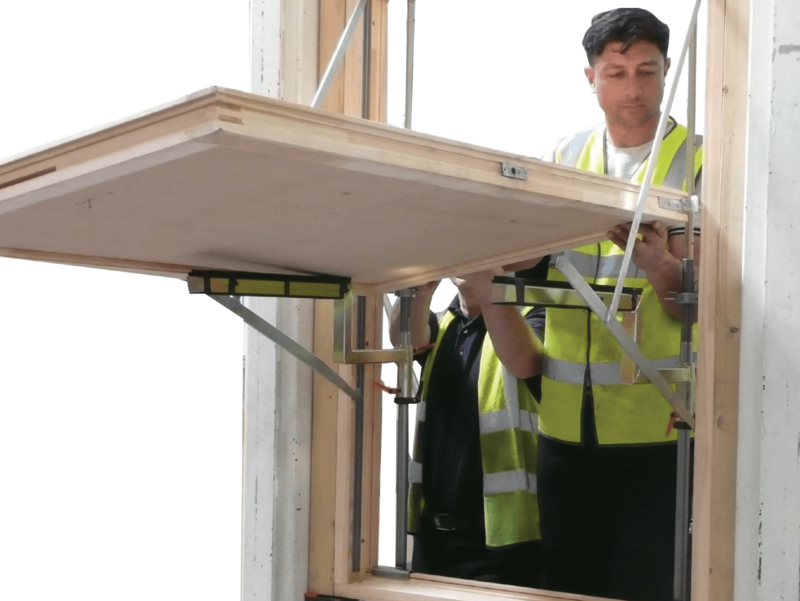 A lot of our work involves removing window openers for refurbishment in schools, offices and hotels and this tool saves time and money allowing teams to split up when working through buildings and all without the need for towers and scaffolding. Also comes with excellent backup and I would not hesitate in recommending the Sashmate for either commercial or domestic use. I have found the Sashmate to be a useful piece of equipment. We have been using the Sashmate for several years now and found it to be a very useful addition for our engineers. Not only does it work well ‘does what it says on the tin’ but it adds confidence both for the fitters and the managers who can plan installations knowing the fitter does not need to call in for help. We would recommend the Sashmate! We have found the sashmate to be an invaluable tool for our service engineer and would thoroughly recommend it as it has major cost benefits for our business, congratulation on a great invention and a well engineered tool, good backup service too. - Peter Gibbons. Gibbons Windows. The Sashmate has got us out of trouble many times since we bought it just 5 months ago. The team use it regularly and it has saved us money on scaffolding and reduced the risk of them working at height. It is a great piece of kit that has definitley paid for itself in time and money saved as well as making our workers safer. Over all the Sashmate is a very worthy buy and I would suggest the industry professional use it. Being a large maintenance company in the social housing sector we had a variety of issues when It came to window repairs/maintenance. Chief among these were obviously cost and safety. I contacted Daniel(Glazesafe) after seeing the website and ended up purchasing five sets of side and top hung tools. It was obvious very quickly that these new tools were having a very positive impact on efficiency with operatives now able to carryout more repairs single handedly and without the need for a second person. Jobs were also being completed more quickly which resulted in us increasing the workload for our staff. With feedback obtained during toolbox talks etc. it was also apparent that operatives felt far safer carrying out repairs with these tools, even preferring them over two man jobs. We have now ordered another 10 sets of the sashmates and Daniel has been to our site to carry out some training for the rest of our operatives. We have now revised our method statements to include their use and are in the process of rolling them out across all of our sites. We are taking steps to expand to a national level and have full confidence that we will use the Sashmate tools in our new business. Marshalls Building Contractors We have been using the Sashmate tools for nearly 4 years now and we are well pleased! The tools have got us out of trouble many many times and mean that one man can do the job of two saving a wage for the company. The job really is easier and safer now we use the Sashmate tools and means that we do not have to work at a height using ladders for these particular jobs! The Sashmate has made jobs so much safer for my lads. After a day they had got to grips with it and now they insist on using it every time. I recently purchased your product the sash mate, After some scepticism about how practical it would be and how quick it would take to get familiar with how it works. However I now feel obliged to inform you of just how pleasantly surprised I am and how much of a useful tool this is to have on board. It’s easy to store on a small van and saves time on what sometimes could turn out be a two man job, Its a great product and would definitely recommend any glazing or Upcv repair company having one handy at all times. I used the sashmate side hung to replace a mechanism and friction stays on 2 side hung uPVC windows on the 4th floor of a block of flats. Without this excellent bit of kit I would have needed scaffolding. Saved the customer time and money and got the job done quickly and safely. I am so pleased I invested in the Sashmate; it has given me an extra arm meaning I can do a job by myself when I need to remove a window from the frame, whereas before I would not have attempted it on my own. The Sashmate makes my job when dealing with friction stays, hinges and window locks etc. so much quicker and so much easier, not to mention safer. I would highly recommend the Sashmate; it is my new employee that I don’t have to pay. I used the side hung Sashmate for the first time yesterday & to be honest don’t think I could have carried out the job without it, no access from outside due to a conservatory , & to be honest dangling from a ladder is not that much fun anyway. So in short very pleased to have bought it & I look forward to using it again, it makes things so much easier & as I said before it looks so much more professional turning up with the right tools for the job. Just to let you know that I’ve used the drop kit on a few jobs recently, and has worked well on all of them. I havent come across a top vent that it wont fit so seems to cover all of the smaller ones. A couple of the jobs had resticted internal and no external access, so without the kit would not have been able to repair them. 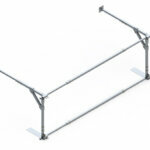 I’ll put a post on to the Dawta and ICL forums recommending the Top Hung with drop kit. 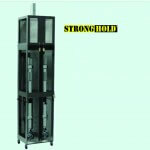 The Sashmate unit was purchased and although it has only been used on limited occasions so far, it will I`m certain, out weigh any costs we initially faced. I completed a job last week on a UPVC window casement top hung 1.2m high by 1 m wide. It was on the first floor bedroom window approximate age 15 to 20 years. It looked PVC and the hinge on the left looked damaged due to the fact that a window cleaner had used it as a hand hold on the long way down to the concrete below.I thus ordered the hinges top hung 24 inches. I arrived and noticed the first problem – the hinges were riveted on. So I erected my sash mate to hold the window in place. Drilling the rivets off I grabbed the window and noticed my second problem. The window weighed a tonne. It looked PVC but in fact was steel and probably fitted with laminated double glazing glass. This job took 3 attempts and a lot of patience to achieve and without the sashmate it would of been near impossible but I managed it. I fired in a couple of securing screws one each side and secured the rest in place. It was now judgement time. I secured the sashmate and the window stayed put. Good sign. I tried the window and cycled the hinges – they worked and the window closed nice and neat. The problem was solved and I had saved my customer the cost of a new window. Using the sashmate has enabled us to save money on scaffolding costs, and also alows us to change sashes using one man instead of two -it has paid for itself after the first few jobs!